Even little thinkers have big thoughts! This series gives kids permission to ask important questions, the same ones philosophers have been asking for thousands of years. Volumes are full-color and feature discussions that are sure to thrill thinkers around the globe. Sophia the Wise narrates and leads students through activities so they can try out ideas for themselves. Encourages skills such as critical thinking, problem solving, communication, and creativity. Includes four books one each of Let the Thinking Begin; Metaphysics: What Is All This Stuff? ; Aesthetics: Gee, That’s Pretty! ; and Environmental Philosophy: Think Green! Also includes one audio CD for each book, one resource CD with lesson plans, blackline masters for worksheets, assessment and evaluation tools, and learning pathways for multi-level classrooms. Books are 24 pages each. 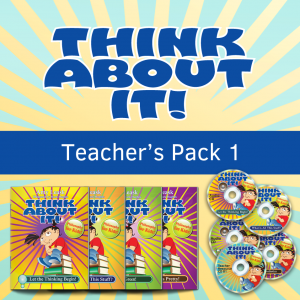 Buy a set of the book to suit your class size and build a customized library of your favourite KidsThinkAboutIt titles! Each add-on pack contains 5 copies of the book. Prices include shipping and handling.